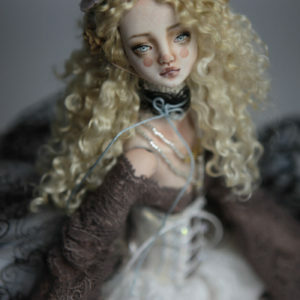 Forgotten Hearts dolls are made in porcelain by AiiS Roman & Gamalier Bravo. I cannot remember my childhood NOT being creative . Since my early years my mom and dad let me experiment with all kind of materials. They told me I was an artist and I believe them. I owe most of what I am today to them. From a very early age I developed a fascination to draw, paint and create all sorts of things. I was a quiet, shy introvert child with a constant unsatisfied thirst of knowledge about the arts and crafts. I studied Business in college which I did not pursue and decided to trust my heart. I ended up teaching myself everything I know about arts. As a self taught teenager I became pretty good at classical oil painting. I studied the Old Masters, and Victorian artists such as William Adolpe Bouguereau and Sir Frederic Lord Leighton by myself. I was not the average teenager. I was definitely a young lady with an old soul with a keen sense of purpose, deeply in love with the classical/spiritual music and art. All this became a solid foundation of what Forgotten Hearts is about. I met Gamalier in 2011 not knowing he was my neighbor since I was little. A very talented artist. Since then Forgotten Hearts dolls are made by the two of us. He has the knowledge I do not have and vice versa. We make a great team as an artist couple. We have transformed what is known as a traditional doll in to something totally modern taking the female anatomy to its highest level in detail and aesthetics. The “Ball Jointed Dolls” as known in Japan are articulated collectible dolls . The ” BJD ” has a special mechanism which allows you to pose with ease. Our work is a combination of words, music and art. They all have a message to tell based on our own experiences inspired on the afterlife, spirituality, motherhood and memories of the past. We give a unique personality to each one of them. That is why we have incorporated the poetry and videos that are also created by us. Forgotten Hearts dolls are classified as “One of a Kind” ( OOAK ) they are unique collection pieces. With over 10 years of experience, the end result is a fusion of artistic techniques where sculpture , painting, engravings, illustration , hairdressing , fashion design, poetry, photography and video among others are complemented to create a captivating and unique piece of art. Everything that involves the making of our dolls is completely handmade. Their wigs are made with real hair and modern styles with Japanese and European trends. Tattooing in modern times has been accepted as a medium of artistic expression. We have incorporated the tattoes symbolically in our art using engraving techniques to represent specific subjects on every doll. Their outfits are inspired by styles such as Anime, Art Nouveau , Harajuku , Victorian, Gothic and others. We incorporate gemstone jewelry like diamonds , agate and pearls. Shoes are also handmade, these include a wide variety of styles like platforms , sandals and slippers. 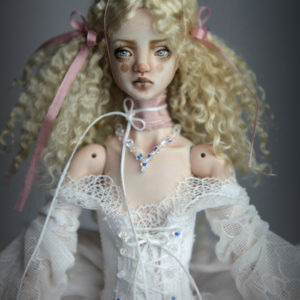 Dolls are made using the finest and silkiest milky white translucent porcelain. They have fully articulated bodies with up to 21 articulation points with leather lining on every joint for a smoother rotation. Some of them have engraved and painted luxurious tattoos. They are painted with permanent china paints, the same that are used in ceramics and porcelains that resist scratches. They all have realistic hand painted face features, soft removable mohair wigs. Their outfits are entirely hand made and one of a kind.